Roadmap had a confusing website focused on features. I simplified its call to action, and developed a content strategy based on impact, not features. 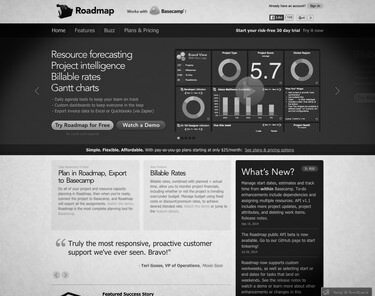 I worked with Roadmap to focus their website on customer impact, not a list of features. I took a complex and confusing site that lacked a direct call to action, and streamlined it into four concise pages. The original website hid content within a carousel, which analytics showed people did not interact with. After goal conversion tracking, I found that having one primary call to action led to the most conversions. 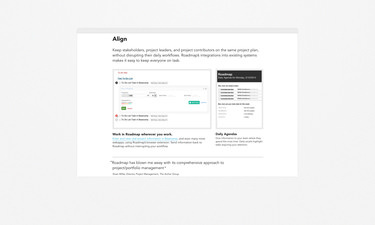 I organized the content of the landing page around four action words – Visualize, Align, Forecast, and Manage. 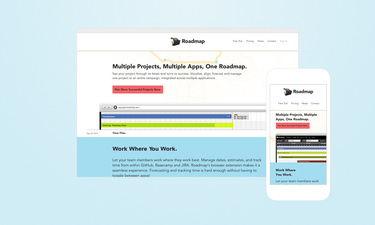 I matched features and customer testimonials to those action words, providing a snappy introduction to Roadmap. Action words helped organize the features I wanted to showcase. Through a simple content strategy and direct implementation, I created a responsive marketing platform that boosted conversions and provided a solid foundation for a redesigned onboarding experience and application design.